The Great Neck North High Blazers Varsity Basketball team fell to Bellmore JFK on Jan. 29. 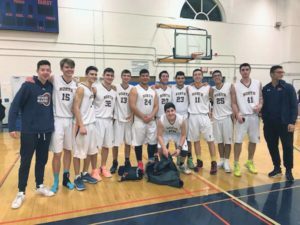 The scorers were Cronin with 13, Kamali with 11, Hakim with 7, L. Hakimian with 6, Youseffi with 3, M. Hakimian with 2, Kadouri with 2 and Nouriely with 1. On Feb. 2, the Blazers beat the New Hyde Park Gladiators 52-46. Highlights included Noah Hakim saving the day by diving all over the court and having a team-leading 7 steals. Kyle Kamali scored a barrage of three pointers and all of his points—19—in the second half. Gio Nouriely played fantastic defense and rebounded on both ends of the floor. Luke Hak showed flashes of greatness, as he had numerous assists and defensive stops. Another highlight was Sharp Shooting Manny Hakimian, who was recently called up from JV. These sophomores are coming. Scorers were Kamali with 19, Cronin with 12, Youseffi with 6, Hakim with 5, M. Hakimian with 5, L. Hak with 3 and Nouriely with 2. The last two home games are scheduled for Feb. 6 against Carey and Feb. 9 against Elmont. Come support the team. Previous articleHappy Lunar New Year!